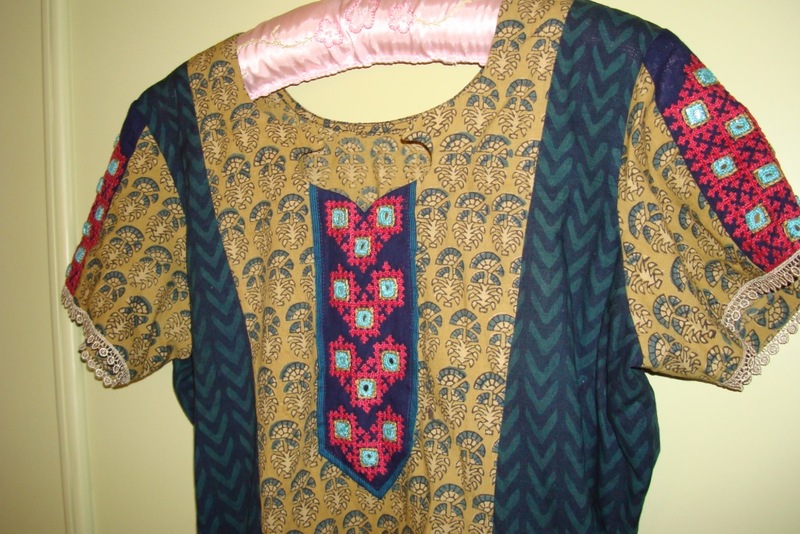 I wear a indigo blue salwar[readymade] to match this tunic. The sleeves also have a lace border. 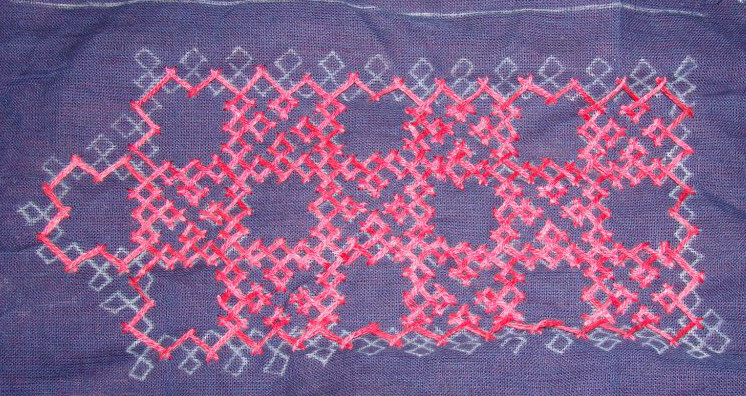 The yoke with indigo blue pipin. 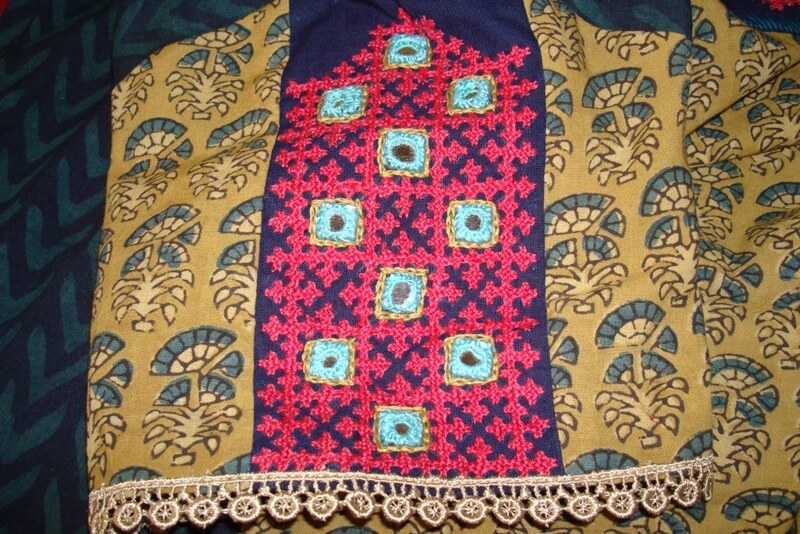 Though the sleeves has a continuous kutchwork pattern, the yoke pattern can be worked with many colours, the yoke pattern can also be used for sleeves and shoulder panels. just suggesting some ideas. I tried medium pink thread and light blue to work the embroidery. I would like to see other combinations, or maybe some better colours used on this olive green and indigo fabric. If someone tries, please post the link on the comments. The tunic fabric, since it is handloom and vegetable dyed, feels so comfortable on the skin [especially during hot humid summer] and the fabric also drapes well. 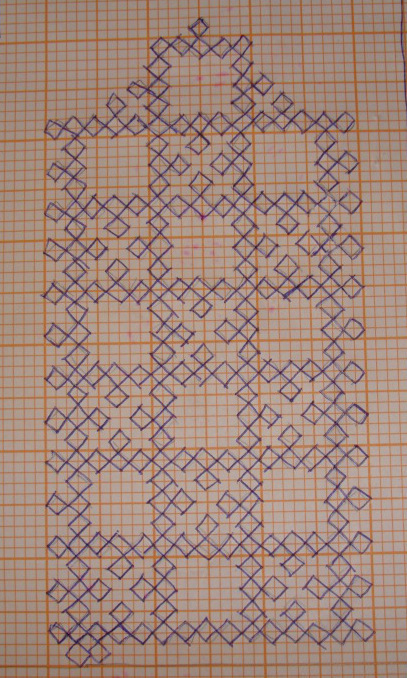 this is simple kutchwork pattern to work. try it and if it poses a problem, state them on the comments. let me see if can do anything about it. 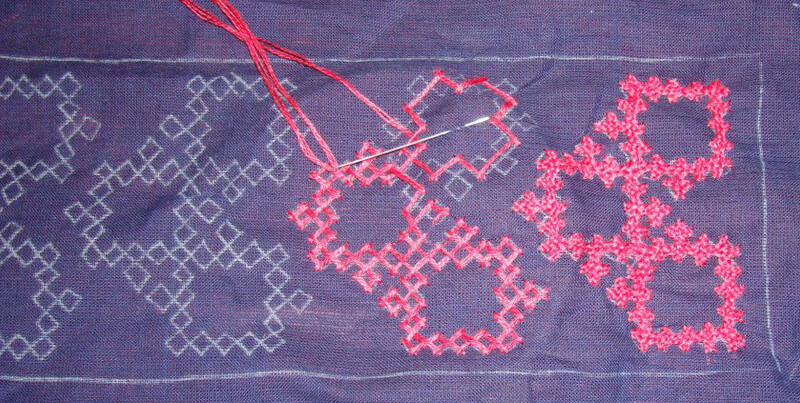 The simplified version of the sleeve kutchwork work pattern was drawn for the centre. The inside part of the three squares were worked first. The picture shows the working on the outer edges, this was done in one continuous journey for each element. The outline for the mirrors done in chain stitch. The yoke after working the mirrors in light blue. The sewn tunic on my next post. 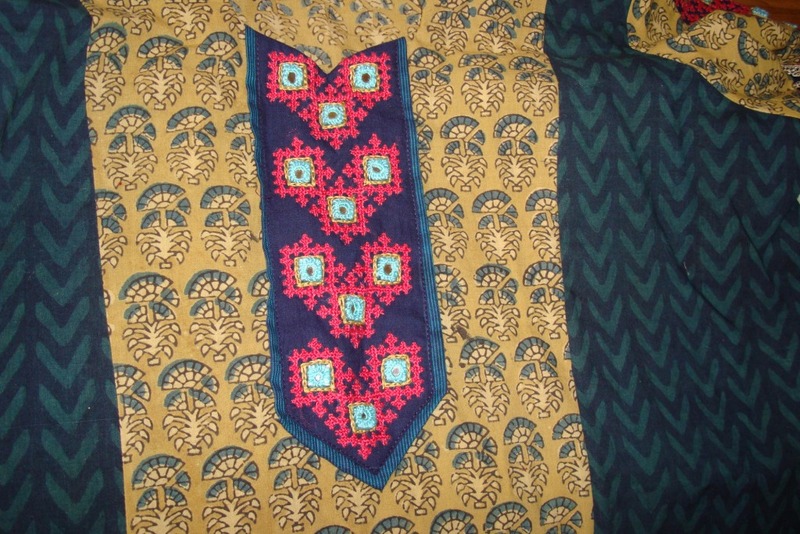 Whenever a tunic made of two or more fabrics it inspires me to design something ethnic. With this purpose in mind two fabrics were chosen. They were block printed with vegetable dye. Sometimes the colour of the dyes gives the print a name- kalamkari. Kalam means pen. kari means work. I have seen a kalamkari artisan drawing on a fabric. The fabrics of this tunic was commercially block printed with the same vegetable dyes. The tunic was made of three panels, the centre in olive green and the sides in indigo. And the sleeves were also in olive green. 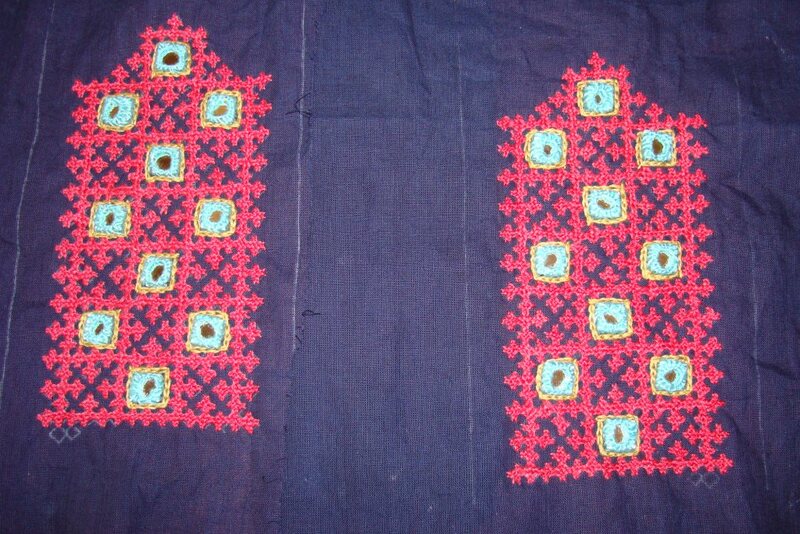 The kutchwork patterns were individually drawn for the centre and the sleeves with spaces for mirrors. The detail of the sleeves. 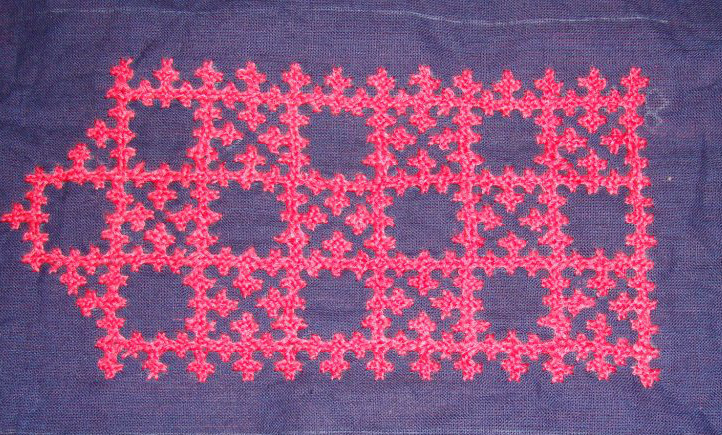 The kutchwork was done in medium pink on dark blue fabric. The mirrors were worked in light blue thread. All the intersecting squares were worked in the first stage. The details of the yoke and the tunic on my next post.